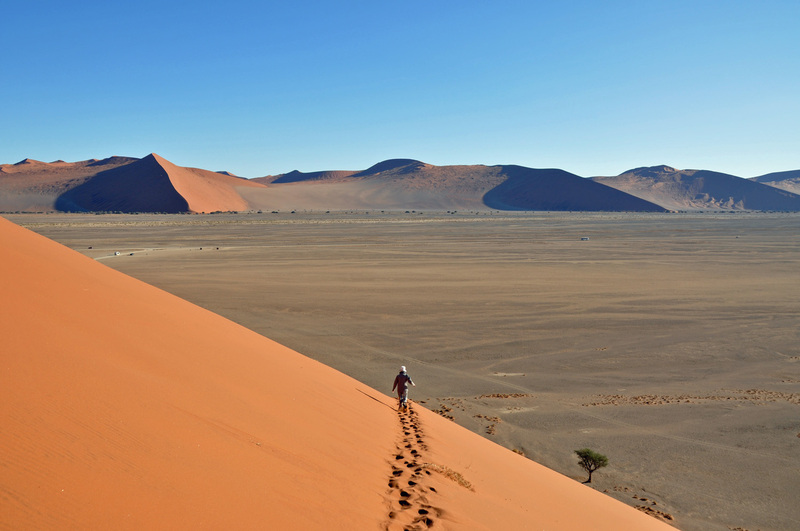 Namibia has around 5,000 km of Tarmac roads, and 40,000 km of gravel roads. The gravel ones are simply the desert which has been rolled flat (ish), mostly quite wide, but with no edging and sometimes hard to determine road from desert. They can become quite ridged and stony, causing both damaged windscreens and flat tyres. There’s a roaring trade in little shacks, probably 100 km apart, at the side of the road promising tyre repair and you’re given a list of repair shops country-wide, as part of your essential travel kit. 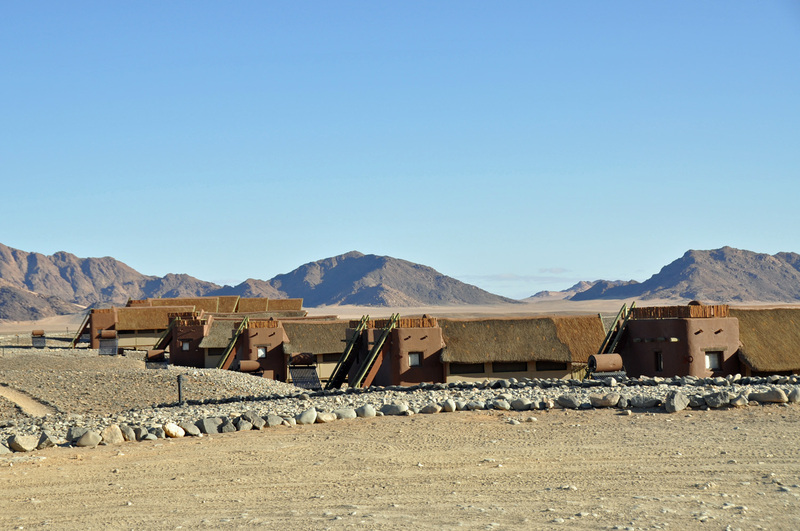 We drove around Namibia and, although the journeys are longer than the fly-in, fly-out alternative, you really see the countryside and appreciate the vastness of Namibia. Strategically placed points of interest usually demand journeys of around 350-400km a day but spending two or three nights at a lodge or town ensures you’re not tired. 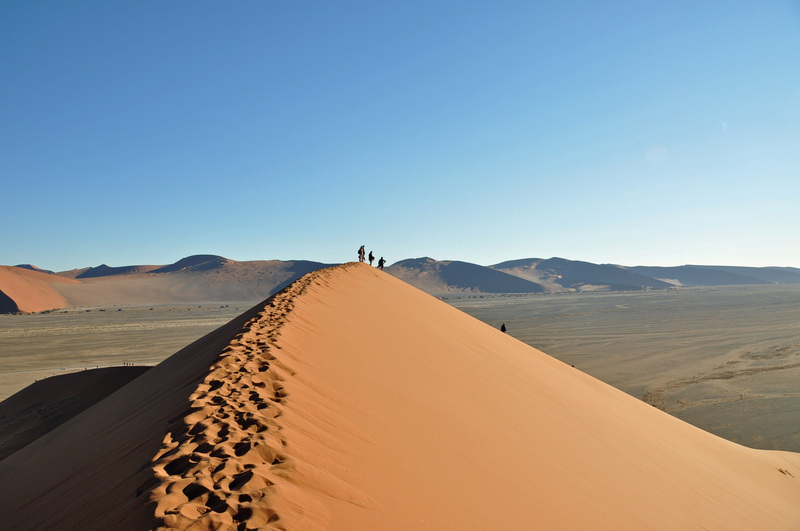 First stop after leaving Windhoek was Sossusvlei, an area towards the west coast famous for its mountainous sand dunes. 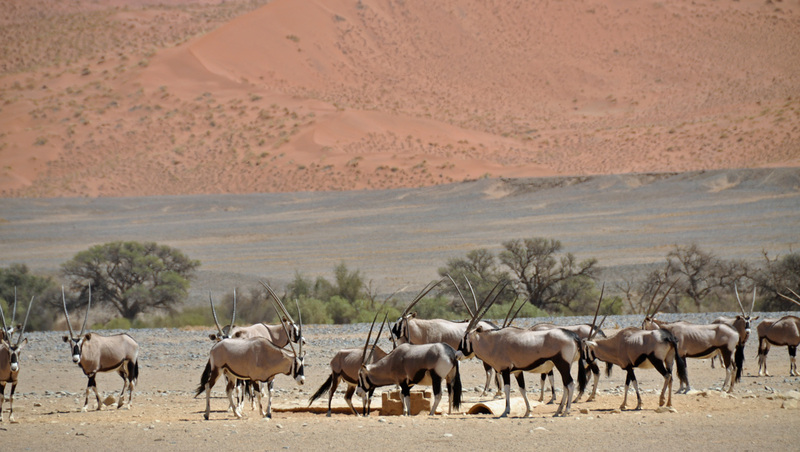 The sand migrated from the Kalahari on the Namibian-Botswana border driven by the prevailing easterly winds, piling up into huge sand dunes. Over time these petrified, retaining their overall shape, with only the top surface sand shifting with the winds. This allows the dunes to be identified and numbered or names. 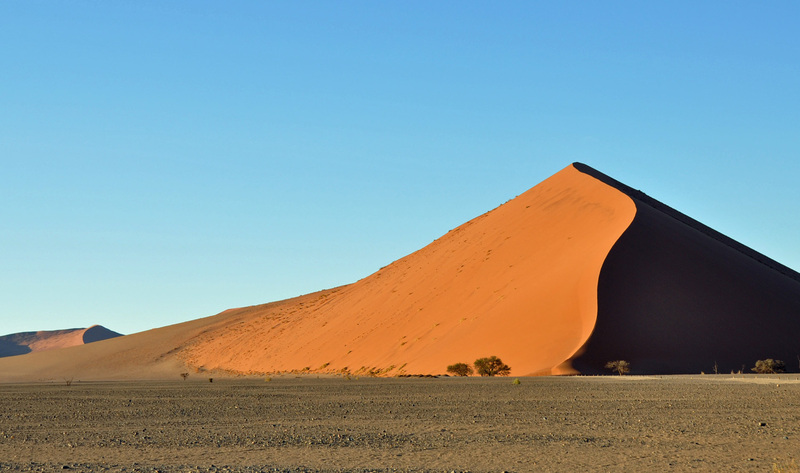 Dune 45, for example – a popular one to climb which is around 80m high. Others are up to 325m high. 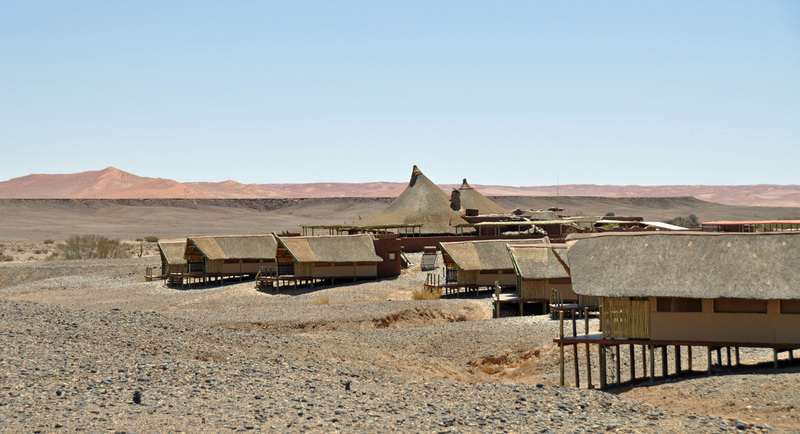 There was a river [the Tsauchab] heading out to the sea but eventually it was stopped by the build up of the dunes and all that remains now is the flat river bed between the dunes, and an amazing dried up lake known as Deadvlei. 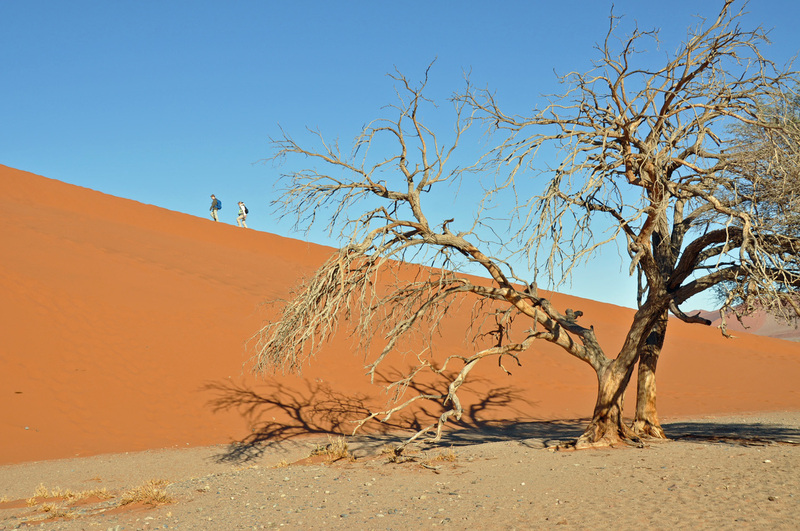 Sticking up out of the dried up lake bed are the remains of trees that have died many hundreds of years ago but haven’t rotted, as even bacteria is unable to survive the harsh conditions. 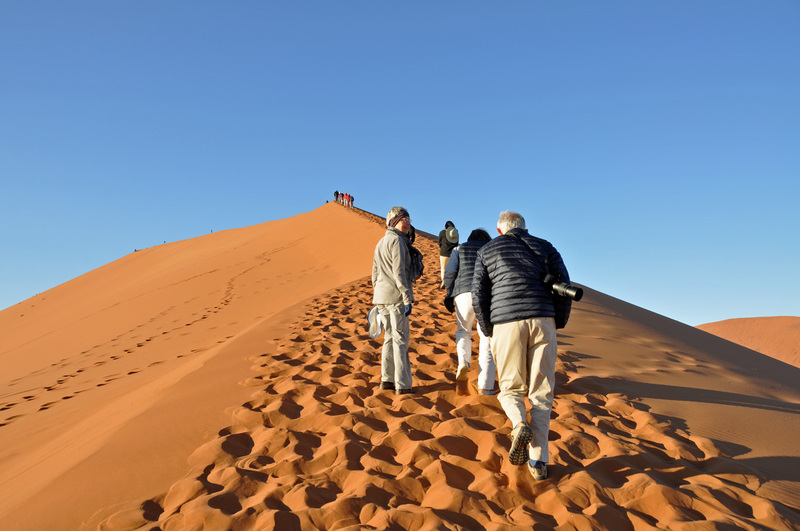 We climbed Dune 45, only to be recommended in the very early morning before the heat of the sun makes it impossible to even touch the sand. 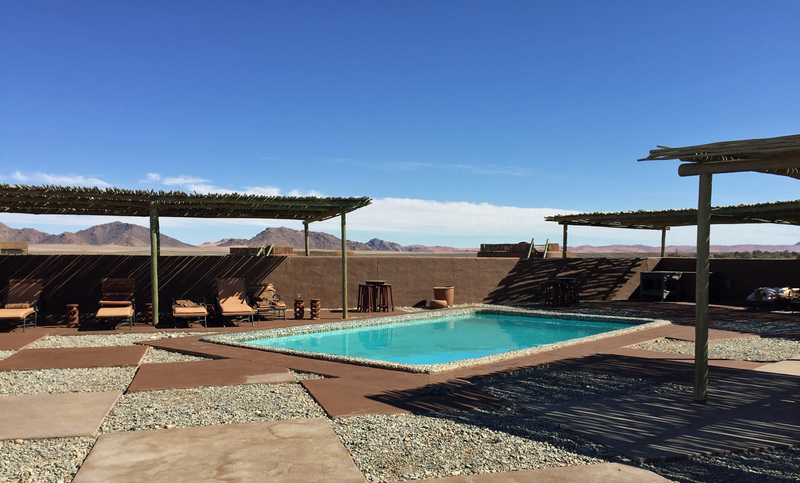 At the end of our 400km drive we arrive at Kulala Dessert Lodge. 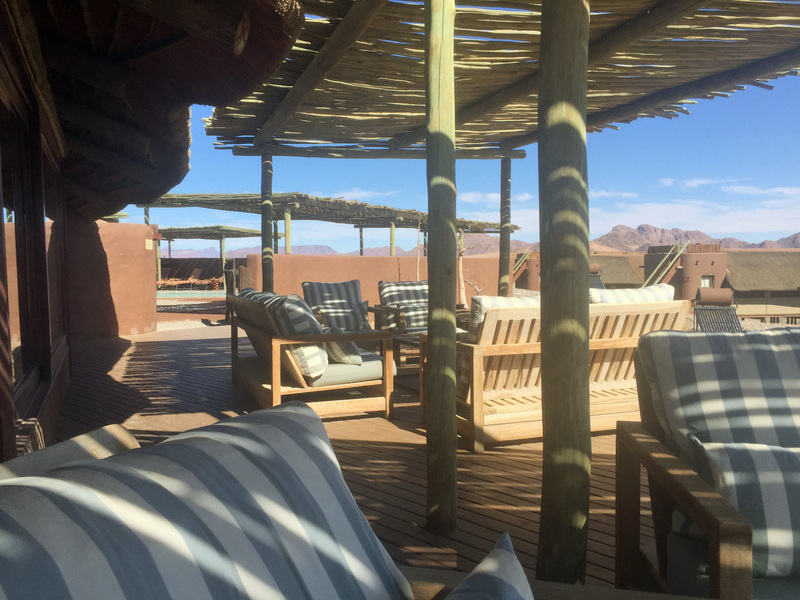 It isn’t in the Sossusvlei National Park, but it has its own private gated access and makes it ideal for easy access to the dunes without queuing at the main park entrance. Its setting is almost lunar – and spectacularly beautiful. 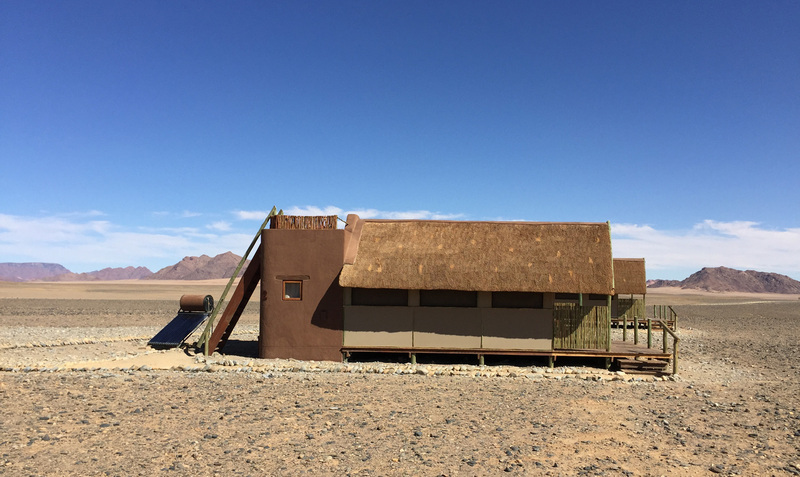 There is a main lodge with a series of tented en-suite rooms arranged either side – a layout with which we become familiar as we journey through Namibia. 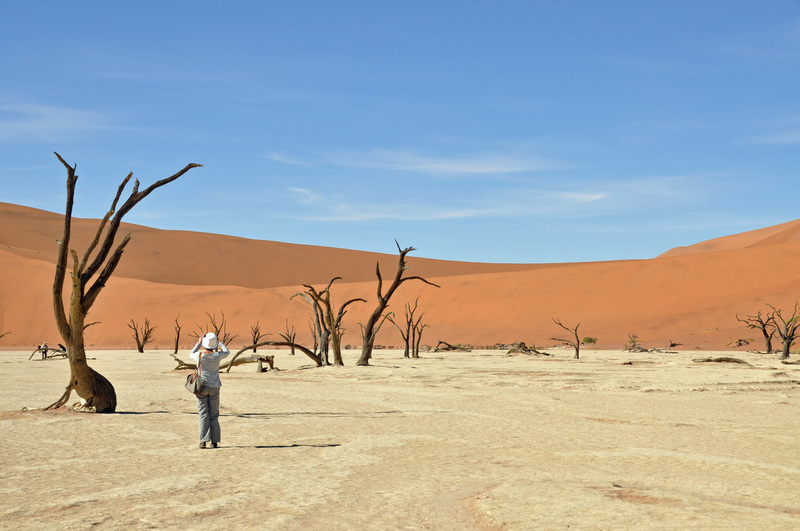 It is very hot during the day but, as with many deserts, it cools off rapidly. As we go to bed in our tent we find welcome hot water bottles. The following morning as we dress for the dune walk we deploy the fleece jacket, gloves and woolly hat more normally suited to Yorkshire winter walks. By late morning it’s very hot indeed. Another recurring feature is the quality of the lodges; the staff are unfailing welcoming, friendly and polite. The food and wines excellent. Kulala is an amazing introduction to this equally amazing country.